Hi there! Today I’m sharing a review for a new M/M romantic suspense from HelenKay Dimon. 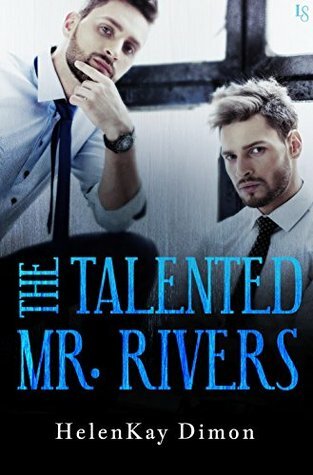 THE TALENTED MR. RIVERS is the second book in her Tough Love series and is best enjoyed after MR. AND MR. SMITH. Will Rivers is the youngest child in his nefarious crime family. In the first book, MR. AND Mr. SMITH, we learned that Will’s family ran Pentasus, a corporation known for human trafficking and murder-for-hire. The situation resulted in a huge fire-fight on the Rivers’ estate and an explosion that killed Will’s ailing father and murderous sister. Will’s not sure if his brother escaped, but the first person who finds him hiding in Paris is his bodyguard, Hunter. Hunter is a deep-cover agent from Germany’s secret police. He discovered Pentasus, its activities, and the principals–the Rivers family–but Will was the sheltered bookish half-sibling who’d spent the past ten years in the US in college and grad school. He’d only returned to England to attend at his father’s death bed. Hunter was immediately drawn to nerd-chic Will and the two months he spent watching him, gathering intel for the CIA co-op, were fraught with mutual attraction. They never stepped past the boundaries: Will was afraid any liaison would make him weak in front of his feuding siblings, and Hunter wasn’t sure he could stomach any physical contact with Will if he was directly involved in Pentasus. Now, however, Will claims he wants nothing to do with Pentasus or his tainted legacy. That doesn’t mean he’s free to go. No, there are factions who are pushing Will to take up his family’s mantle–if only as a figurehead. There’s millions at stake, and Will’s not sure which side Hunter is on…until the CIA comes a-callin’. I liked this one better than the first book in this series. Will and Hunter have had a long time of close interaction for a slow burn to develop. We already knew there was something going on in the first book, so stepping in at their beginning is really easy. Also, we know that Will’s a decent guy from the start. Hunter doesn’t want to fall for him and isn’t convinced Will’s completely innocent, but the more they battle to gain Will’s freedom, the more Hunter learns he can’t step back. It’s a fast-paced, romantic thriller with very high stakes. There are lots of room for double and triple-crosses, but the heart of the story is two solitary men finding solace and support. We get a return of deep-cover CIA agents Fisher and Alex, from the first book, as well as Seth who takes a front-stage role here–so I expect he’ll be the focus of another/the next book in this series, if it continues. Expect bullets, backstabbing, back-biting, big men posturing, late night heart-to-hearts, love and sexytimes. And an HEA. Interested? You can find THE TALENTED MR. RIVERS on Goodreads, Amazon, Barnes & Noble and AllRomance. HelenKay Dimon spent the years before becoming a romance author as a divorce attorney—not the usual career transition. Now she writes full-time and she’s much happier. The author of more than thirty novels, novellas, and short stories that have twice been named “Red-Hot Reads” and excerpted in Cosmopolitan, she’s on the board of directors of the Romance Writers of America and teaches fiction writing at UC San Diego and Mira Costa College. You can find HelenKay online on her website, Facebook, twitter Tumblr and Pinterest.